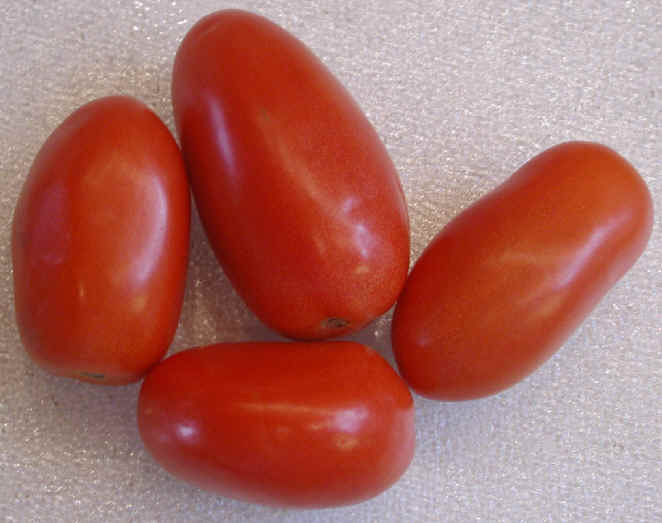 (Roma Tomatoes (Italian or Plum)) This oval or pear shaped tomato goes by a variety of names: Roma tomatoes, Italian tomatoes and plum tomatoes. 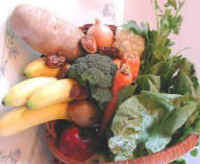 They have more pulp and less water content than the round varieties, thus they are better for cooking and making sauce. We also enjoy them in our salads. The best tasting tomatoes are those that are vine ripened. Most commercial tomatoes sold in the markets are picked just at the point when they are beginning to turn red, and then they are ripened in transit being subjected to ethylene gas just prior to delivery - as a result they never have a chance to gain their full natural flavor. Select tomatoes that are firm and free of bruises and wrinkles. See nutritional chart below.